The American Ivy Society has selected Hedera helix ‘Eva’ as the Ivy of the Year for 2009. Some say that newer is better, but this is not always the case. ‘Eva’ certainly proves this with its beautiful creamy-white foliage. This variegated ivy was discovered in the early 1960’s by Tage Melin of Hjallese, Denmark, and the name was published in two German magazines Gartenwelt and Ziepflanzenbau, in 1966. Since that time, this ivy has traveled the world becoming a very popular houseplant. ‘Eva’ is a Variegated Bird’s Foot ivy in the Pierot Classification system and has three forward-pointed lobes with the terminal lobe up to twice as long as the laterals. The variegation is a cream to white margin with a green-gray center. The leaves are arranged close on the stem. It is self-branching but light pruning produces more branching. If left to her own accord, she will make long runners. This versatile ivy does well as a houseplant, can be used in all types of topiary and has been shown to be winter hardy up to at least zone 6 or -10 degrees (F). For the best color, ‘Eva’ must be grown in good sun light. In lower light levels the variegation may fade to a pale green. In the cool temperatures of winter she will also take on a pinkish hue. For successful out door planting, remember to plant deep, removing several of the lower leaves and planting to the now lowest leaves. Ivy will root along the new stem, helping it to become established. 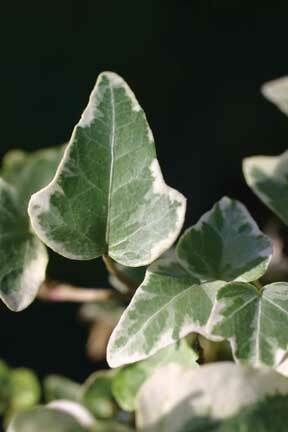 When possible, plant variegated ivies where they will get some protection from the winter sun and wind, which causes most winter damage.